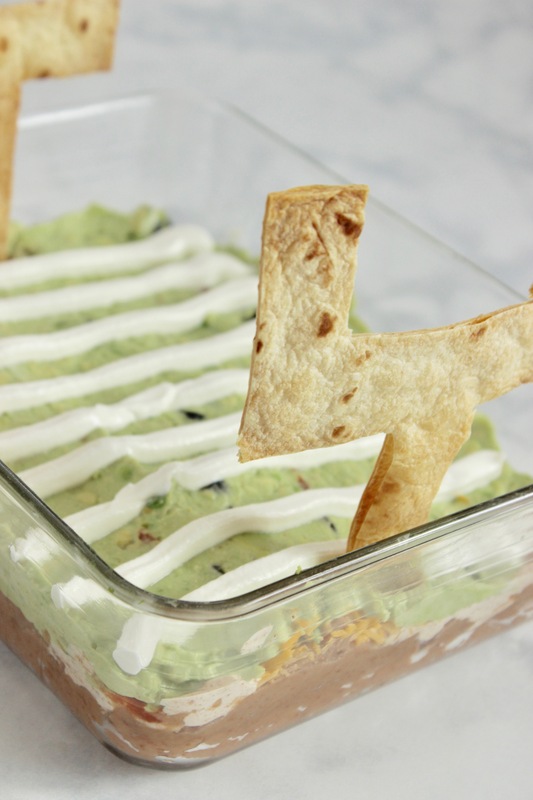 Oh for heavens sake, this easy, cold taco dip blew our minds! So, you noticed that I said “cold” taco dip recipe, right? 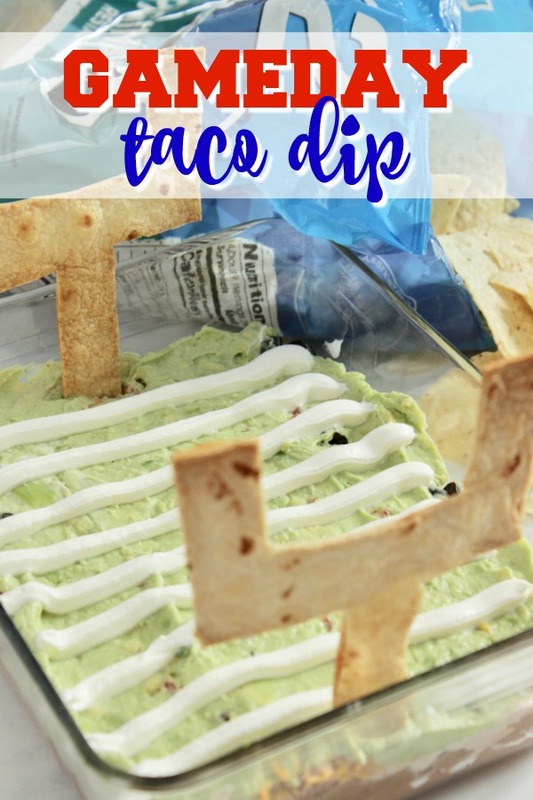 This is the best taco dip recipe all around in my humble opinion, but if you’re looking for a hot taco dip recipe, this hot taco dip is the one to hit up. I first found this recipe when it was included in my friend Tiffany’s Meal Plan. She makes Meal Plans for busy people like us. You can see all of her meal plans here. If you decide to buy a week (or more) PLEASE use my coupon code – it’s the highest one she offers all year long and will get you a grocery list with nightly meals planned out for you for only $2.45 per week. CRAVINGS is the code. Ok, so are you ready for the recipe? 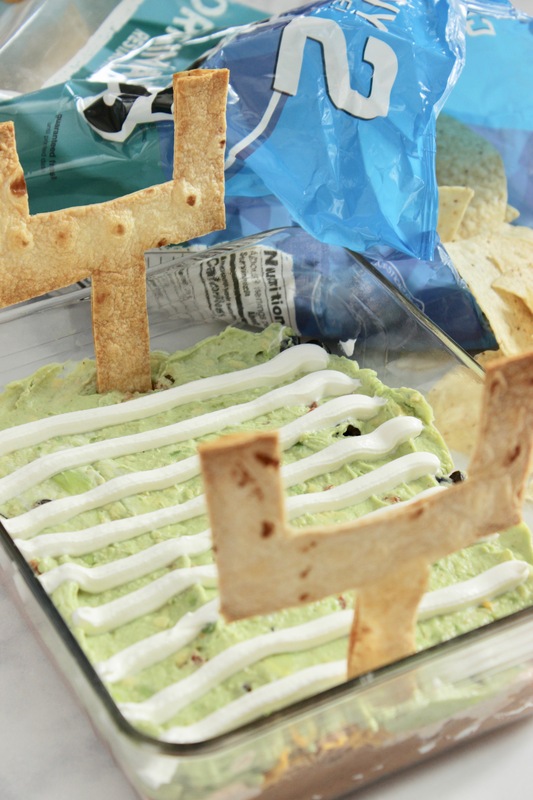 Head on over to Tiffany’s blog HERE to get the full recipe and you’re ready to rock and roll. Are you following the Keto Diet Food Plan? The great news for you is that this is low carb appetizer fits into the Keto Diet Menu too! 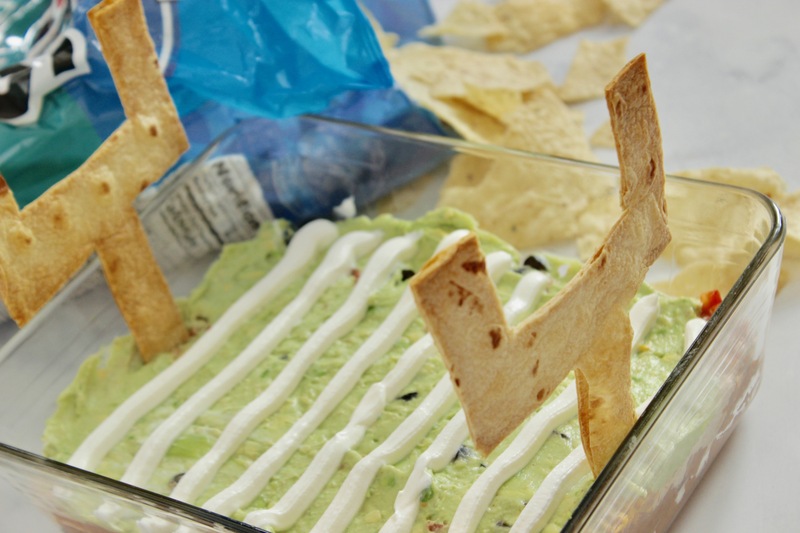 If you’re looking for Keto friendly snacks, this low carbohydrate appetizer is a great option. The one big change that you’ll want to make it instead of using tortilla chips, use lettuce wraps instead. Or, if you’re feeling extra motivated to make this one of your go-to Keto approved appetizers, try making these Low Carb Tortilla Chips. YUM! 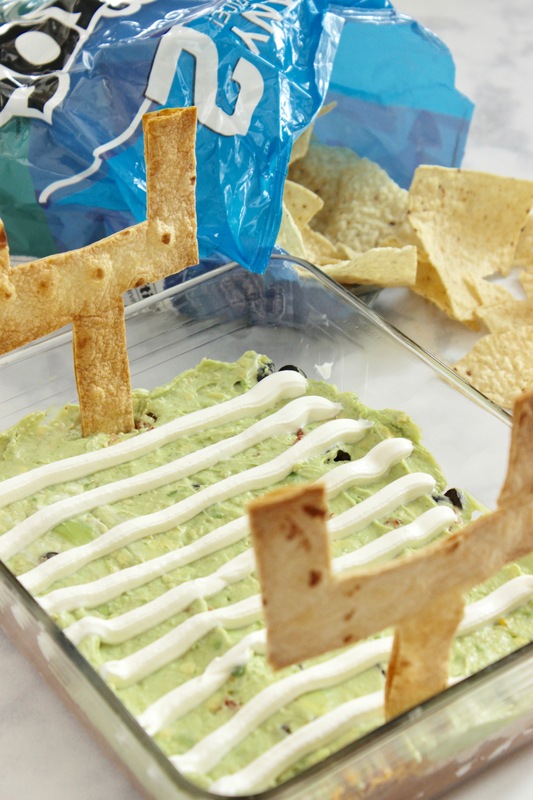 And, unfortunately, to be a Keto appetizer, you’ll want to cut out the refried beans as well. 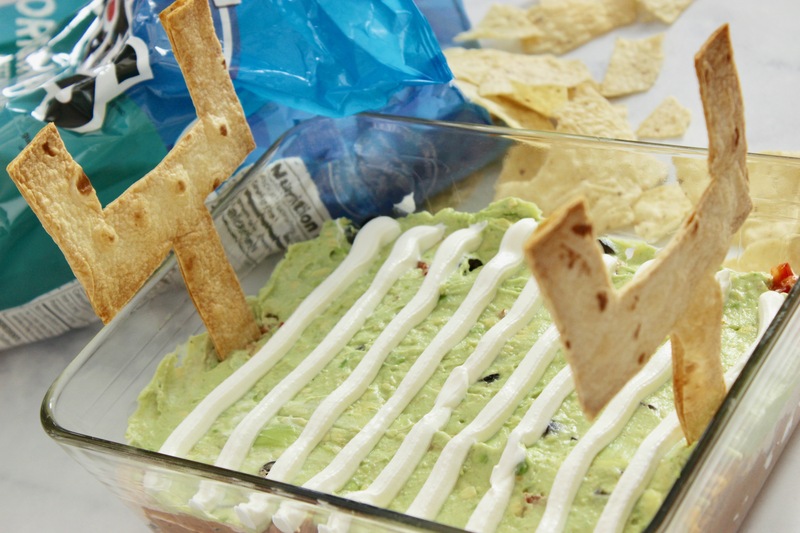 This dip would still be fantastic without the beans and tortilla chips. Promise! These ingredients aren’t on the approved Keto ingredient list, but everything else in this recipe is Keto approved! Awesome, ‘eh?! 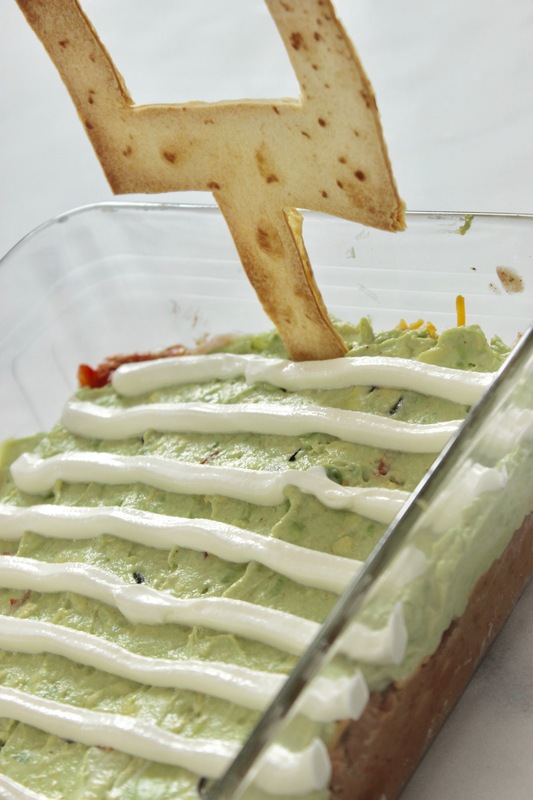 If you’re still with your New Years resolutions (WOW if you are 😉 ) then using baked tortilla chips is a great way to lighten this taco dip up. And, those baked tortilla chips are good, too! 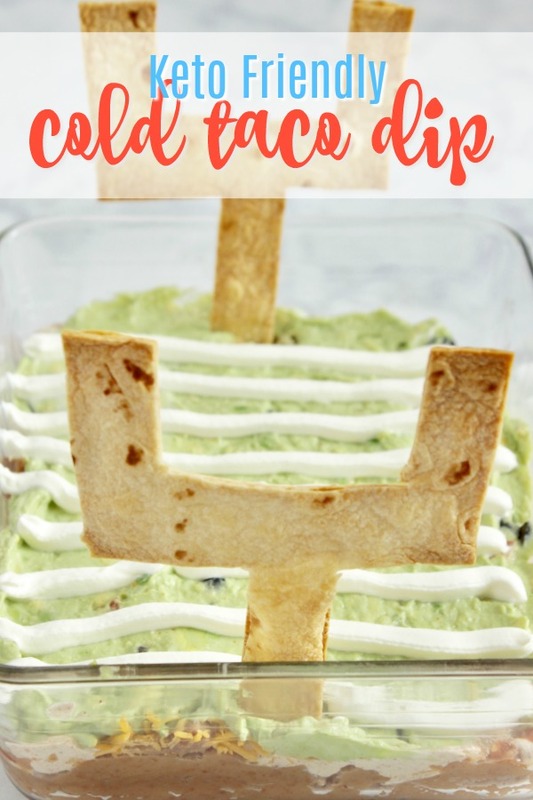 Without adding in any of the cream cheese, (which is a usual suspect in these types of cold taco dip recipes) makes this a tad bit healthier as well! 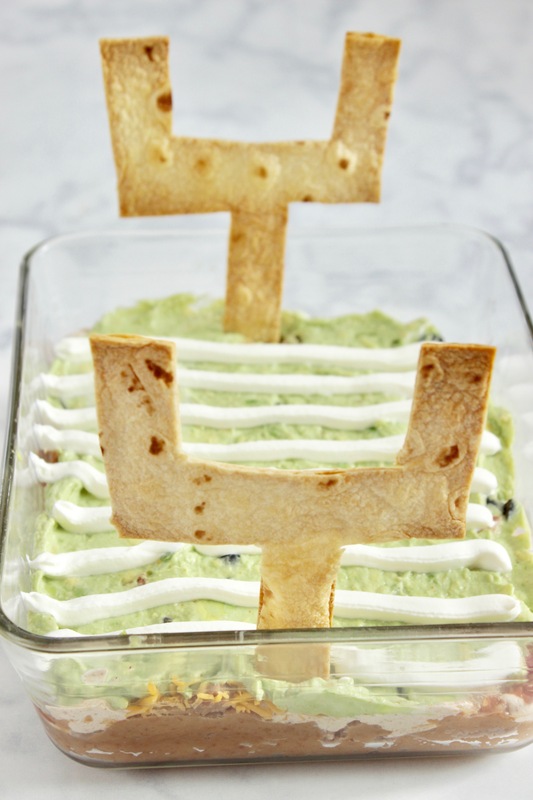 But, although you don’t have any cream cheese, sour cream takes its spot, so going with a reduced fat sour cream will give you even less calories and make this a “skinny taco dip” – sweet! And, it you really, really wanted to get some more greens in your diet, adding in some shredded lettuce is also an option. 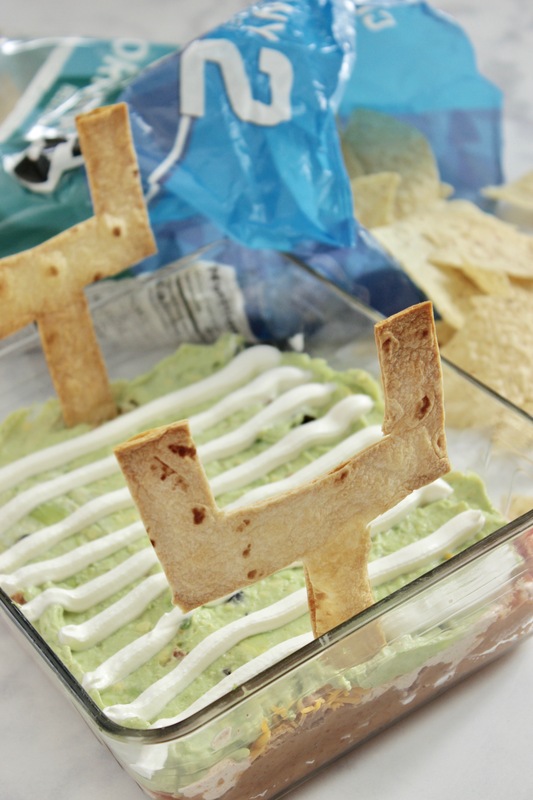 I would put the lettuce on top of the guacamole layer and under the sour cream field goal lines layer. You could even use the remainder of the pepper or diced tomatoes to spell out “go team” on top of the field goal lines or something similar – that would be cute! The taco seasoning mix has barely anything in it but spices, so we know we’re good there, right?! I would encourage you to leave in the red pepper in the recipe, but if you don’t like red pepper, green pepper can for sure be substituted in its place. Or, diced tomatoes would be good as well. If you like low carb appetizers, you might also really love this real cheese queso dip! Under the fourth picture there’s a link (Tiffany’s blog HERE). You can click on that link and it takes you to a page where you can print the recipe. I DON’T UNDERSTAND THE CONSTERNATION. 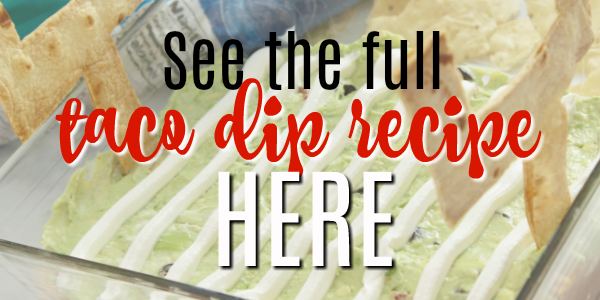 ALL YOU HAVE TO DO IS COPY THE MENU AS SEEN WHEN YOU CLICK ON THE PIC THAT SAYS “SEE THE FULL TACO DIP RECIPE HERE”, THEN PASTE TO A “COMPOSE” EMAIL IN YOUR INBOX. I SAVED TO A MENU FOLDER I CREATED, BUT PRINTING SHOULD ALSO BE EASY.